Under cover of the outbreak of the War Between the States, the megalomaniacal Rance Devlin (Don Harvey) sets out to conquer America’s Western territories and establish a vast empire of his own. 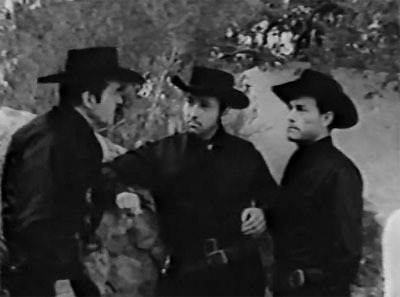 He recruits an army of outlaw followers to help him carry out his ambitious scheme, but is opposed by Army scout Tom Bridger (Lee Roberts), Pony Express station manager Ed Marr, and Captain Carter (Gregg Barton) of the US Army; an Eastern girl named Lola Martin (Norma Brooks) also poses a mysterious threat to Devlin’s master plan. Blazing the Overland Trail might have been more appropriately titled End of the Trail; it was not only the final chapterplay that Sam Katzman produced for Columbia, but also the very last movie serial turned out by any studio. As a finale, it’s none too grand; like the three Columbia chapterplays that preceded it–Riding with Buffalo Bill, Adventures of Captain Africa, and Perils of the Wilderness–it’s a messy patchwork of action scenes from earlier chapterplays, unconvincingly stitched together by routine new footage. 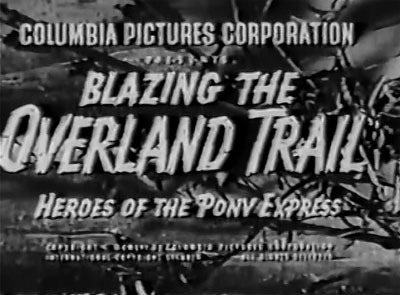 Overland With Kit Carson and White Eagle provide the bulk of the stock footage for Overland Trail; shots of the huge legion of Black Raiders from the lavishly-produced Carson are used to represent Devlin’s private army here, making his goal of conquering the frontier actually seem achievable. However, though the stock footage helps the plot here, it damages it in other ways. Writer George Plympton makes much of the villains’ acquisition of repeating rifles; guns of that type would have given their possessors an enormous tactical advantage on the frontier of the early 1860s, and thus make an excellent and logical MacGuffin. Unfortunately, this good idea is ruined by the continual use of stock footage in which everyone–even Indians (culled from White Eagle)–can be seen using repeaters, thus making all the talk about the value of the “new” guns seem pointless. Above: Lee Morgan watches as Don Harvey gloats over one of his “special” repeating rifles. 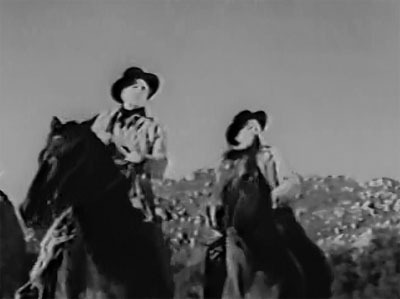 Other potentially interesting plot elements–Devlin’s campaign to force independent outlaw bands to join his army, the heroine’s search for a land grant stolen from her father by Devlin–are not so much undermined as smothered by the stock footage; the endless procession of reused action scenes leaves no room for Plympton to develop any of these subplots. The holdout outlaws are so frequently referred to that we expect them to eventually form an alliance with the heroes or play some other role in the plot–but they only assist the good guys in one brief sequence, and are completely forgotten about before the end of the serial; similarly, the land-grant subplot is really only used to help set up the disappointingly perfunctory and undramatic final showdown. Above: Norma Brooks drops hints to the Raiders about her father’s connection to their leader. The above-mentioned procession of stock-footage sequences is somewhat more linear than in Katzman’s other three last-ditch serials. Overland Trail contains only a few of the flashbacks and silent voiced-over action scenes so common in its immediate predecessors (particularly Captain Africa); instead of spending half their time recalling unseen or previously-seen incidents, the heroes and villains continually race from clash to clash, making the serial’s thin plot seem fast-moving, albeit extremely repetitive. The plot hardly flows along smoothly, however; on the contrary, it often feels confusingly disjointed, due to the frequently cavalier way in which stock-footage action scenes are crammed into the narrative–as when the heroes suddenly stop trailing Captain Carter’s abductors in order to prevent a stock-footage robbery of a Pony Express rider, or when a bunch of raiders abruptly show up to start a stock-footage buffalo stampede. As in all the other Columbia last-ditchers, the bulk of this stock footage comes off as jarringly disconnected from the new characters. In chapter after chapter, Lee Roberts and Dennis Moore are reduced to sitting behind rocks or wagons, firing randomly off-camera, and pretending to take part in enormous battle scenes (like the Chapter One and Chapter Five wagon-train attacks) borrowed from Overland With Kit Carson. When they’re not faking their participation in these gunfights, they’re commenting on action that they’re not directly involved in (like the Chapter Two attack on the Indian village, originally from White Eagle), or else approvingly watching each other pretend to perform heroics derived from Carson or White Eagle (since Moore dresses to match Carson’s star Bill Elliott and Roberts to match Eagle’s star Buck Jones, they can never work in tandem in any scene in which they’re required to pose as the older heroes). Above: Outlaws attacking a wagon train seem unfazed by Lee Roberts’ fire–not surprisingly, since he’s really not in the same serial that they are. Smaller-scaled pieces of action–like the Carson-derived gallop after the runaway wagon in Chapter Thirteen–are edited a little more smoothly into the serial than the innumerable large-scale battles are. However, such chases and fights avoid showing the faces of the supposed protagonists for so long that they wind up feeling similarly disconnected from the new plotline; the brief Chapter Eleven fight (pulled from White Eagle) is one of the very few scenes in the serial in which new close-ups and old long-shots are combined in sufficient proportions to convince us that they’re part of the same continuous action. Original action is almost completely non-existent; director Spencer Bennet occasionally manages to incorporate a picturesque shot of a hero firing off his gun while silhouetted against the skyline, or contrives to have his actors execute a few good-looking punches and falls, but never stages an actual full-blown gunfight or fistfight. 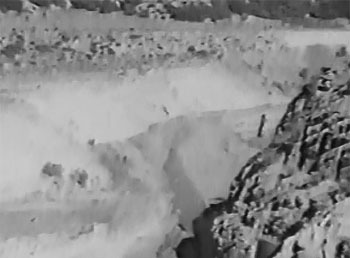 The serial’s cliffhangers–wagon crashes, explosions, stampedes, avalanches, fires, etc.–are all pulled from earlier chapterplays as well. 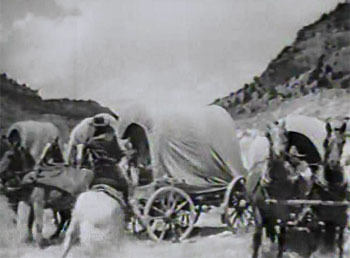 Most of the Overland With Kit Carson chapter-ending footage, though impressive-looking, fits very poorly into Overland Trail–since the Utah scenery featured in Carson (barren semi-deserts, rocky canyons, and enormous cliffs) looks most unlike the expanses of Iverson’s Ranch and the Monogram ranch, where Overland Trail was filmed; mountains and precipices are continually appearing whenever a crash or a rock-fall is shown, and then vanishing from the landscape. The chapter endings from White Eagle (like the burning-wagon sequence) are more successfully blended with the new footage than the Carson stock is, since Eagle was filmed at Iverson’s too. 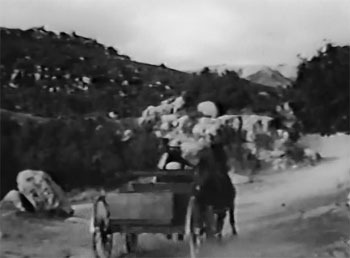 Above: The heroine’s wagon rushes off down an Iverson road (left-hand picture) and somehow manages to wind up hurtling off a Utah cliff (right-hand picture). Above-mentioned co-heroes Lee Roberts and Dennis Moore deliver assured and capable performances, as they go about their task of filling in the gaps between the stock footage. The stocky and gruff-voiced Roberts, a perennial background heavy in Katzman’s serials, seems to be enjoying the chance to finally portray a hero; he expectedly makes his character seem quite tough, but also gives him a much more unexpected air of easy-going cheerfulness (his joking after he finds his ventilated hat is particularly enjoyable). Moore, for his part, provides a good contrast to the almost breezy Roberts, playing his role with his usual deep-voiced sternness and air of sober conviction–although he does flash some smiles when kidding around with Roberts. 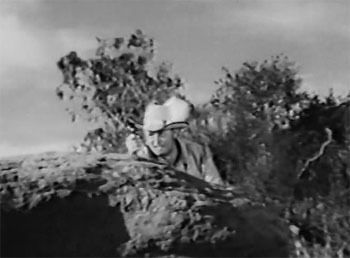 Gregg Barton, a frequent villain in the TV westerns of the era, seems a little unsure of himself in the sympathetic role of assistant hero Captain Carter; he drops the harsh snarl he used in his villainous parts, but in its place adopts a blandly low-key voice that winds up making him sound too mild-mannered for an Army captain (ironically, Barton was a decorated Marine combat officer in real life). 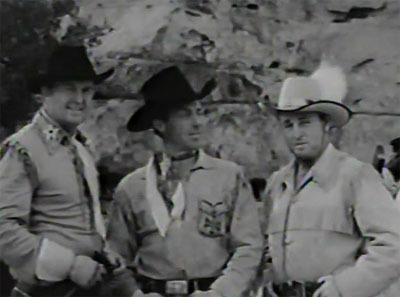 Above, left to right: Gregg Barton, Dennis Moore, and Lee Roberts. As Overland Trail’s brains heavy, Don Harvey, like Lee Roberts, seems to relish playing a non-henchman role for a change. His Rance Devlin only makes brief token appearances throughout the serial, but Harvey plays each of these scenes with flair, delivering a series of power-mad speeches with a combination of dignified confidence and crazed fervor; he’s happily allowed to indulge in these controlled rants right up to the end of the serial, since writer Plympton doesn’t have him admit his impending defeat several chapters before the end (unlike the heavies of Riding with Buffalo Bill and Perils of the Wilderness). 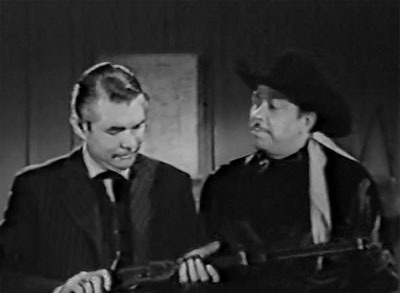 Harvey’s chief henchman is played by the pudgy and laid-back Lee Morgan, who makes an acceptable if colorless action heavy; he’s backed up by Pierce Lyden (as rangy and tough-looking as ever), gruff and grizzled screen veteran Reed Howes, and sharp-faced and wiry Ed Coch–who, though playing a standard-issue Western outlaw, delivers his lines with the same indeterminate foreign accent he used in his turns as a Mexican in Riding with Buffalo Bill and a native in Captain Africa. Above: Ed Coch (center) watches as Reed Howes (far left) and Pierce Lyden snarl at each other. Norma Brooks, the serial’s ostensible leading lady, delivers her lines quite competently, but disappears from the story so frequently (sometimes vanishing for whole chapters at a time) that she doesn’t leave much of an impression, either positive or negative. Stuntman Pete Kellet is quite likable as a solemn and self-possessed young trapper who winds up going to work at the Pony Express station; expert horseman Kermit Maynard makes a series of brief appearances as a Pony Express rider–and, though pushing sixty, shows himself still capable of making a “Pony Express” mount. Al Ferguson, similarly well-advanced in years (but still showing some of his old blustery energy), makes a couple of appearances as one of the outlaws opposed to Devlin’s gang; he’s assisted by two other venerable chapterplay henchmen, both of whom look far too old for outlawry but are still a pleasure to see: Harry Tenbrook and Bud Osborne. Yet another serial stalwart, Frank Lackteen, pops up from time to time as a grimly hostile Indian chief, and Jack O’Shea plays a non-aligned outlaw leader. The best that one can say of Blazing the Overland Trail is that it’s a little better than the three Columbia serials that preceded it. Its villains come off as more formidable than those of Riding with Buffalo Bill, while its plot isn’t as absurdly anachronistic as those of Adventures of Captain Africa and Perils of the Wilderness, both of which unwisely tried to combine stock footage from serials set in entirely different historical eras; Overland Trail also relies less heavily on flashbacks than any of the aforementioned trio did. However, it’s still a sloppy and uninteresting chapterplay–and, as such, doesn’t make a very satisfactory curtain-closer for the movie serial era. Above: Old-timers Al Ferguson (left) and Harry Tenbrook against the Iverson skyline, taking a last ride in the company of another old-timer: the chapterplay genre. This entry was tagged Columbia serials, Dennis Moore, Frank Lackteen, Sam Katzman, Spencer Bennet. Bookmark the permalink. Jerry, you mentioned Lee Roberts had his hat shot off in an early chapter. Not only did the bullet hole remain for the rest of the serial, it also could be seen before the shooting. Good catch, Pa; I only started noticing the hole once my attention was called to it by Roberts’ joking about it. I have to wonder if the hat was holey to begin with, and if that bit was inserted into the script to explain the hole–and thus save Katzman’s prop-men from having to find a new and intact hat matching the White Eagle stock, although that sounds excessively economical, even for Katzman. If I can remember in chapter one there was no hole. Did something happen to the hat that caused the hole, and the shooting was added afterward? Just re-checked the first chapter, and you’re right–the hat is intact there. That makes your explanation–that the shooting bit was put in to explain away an accidental hole–sound pretty likely to me (it says something about the mediocrity of this serial, doesn’t it, that we now have four comments on it, yet not one of them talks of its major facets). ** out of ***** Okay, let’s talk major facets. I went in knowing this was the last serial and so expecting the worst. I honestly thought it wasn’t quite as bad as I expected. The cast did well for the most part, except for a very bland heroine. One thing that occurred to me was that Lee Roberts seemed the main hero early, but it transitioned to Dennis Moore as the serial dragged on. Moore was actually very good in this one. Maturity sat well on him and he seemed able to loosen up and show more personality with age. He ended up getting the girl. If nothing else, there was action. This was not a talk, talk, talk, one. Mediocre, and laughably stock happy, but passable for me. I agree that Blazing could have been much, much worse than it is; again, it doesn’t insult the intelligence the way Perils of the Wilderness and Captain Africa do, and dodges other pitfalls like excessive flashbacks and a villain who gives up before the finale episode. I like to think that the production crew tried to make this one a little more watchable than the previous three, knowing it was the last and hoping to go out on a moderately respectable note. Good point about Moore; in this and in Perils of the Wilderness he does indeed seem a bit more personable and easygoing than in his 1940s Republic and Universal serials. He, Roberts, and Don Harvey all deserve credit for putting some actual personality into roles they could just as easily have sleepwalked through (watch Kenneth MacDonald in Wilderness for an example of such sleepwalking; it’s sad to see such a typically good actor going so wearily through the motions). Watching this is hard….Story is very disjointed..Bad Guys, Bad Indians & Bad guys who want to establish an empire..all fighting eachother…who and what to like is hard…Hero Lee Roberts is riding around with a Hat that had a feather in it…making him look like a Gay Cabbellero the dialogue is very goofy…read where this is last serial made….it should have been the Last ! ! !